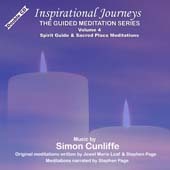 We are delighted to annouce that Volume 4 in this highly successful series of guided meditations is now available. As with previous releases in the series this is also a double CD. The first CD features 2 thirty minute guided meditations. The first,, "Meet Your Spirit Guide" is written by international clairvoyant and palmist Jewel Marie Leaf. The 2nd meditation, written by acclaimed musician Stephen Page is called "Your Sacred Place". Both meditations are narrated by Stephen Page.